Roxanne Villa is a nicely maintained contemporary home that has that “WOW” factor you want for an unforgettable Caribbean vacation. This home has it all: lots of space and privacy, upscale furnishings, private pools, indoor/outdoor living, and stunning ocean views. Roxanne Villa is also conveniently located in the Gustavia area, where you will find lots of shops, restaurants, nightlife, and more. Whether you have a larger group or a smaller one, you will feel right at home in this comfortable and modern villa that has plenty of island style, along with the peace and quiet you are looking for. 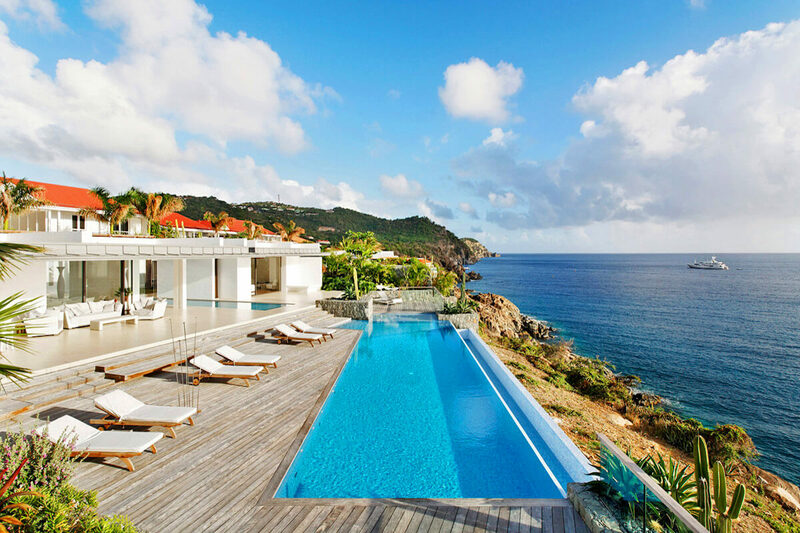 Villa Roxanne is located in Gustavia, St Bart’s. It has 6 bedrooms and 6 bathrooms with two pools. From the large infinity edge pool it opens onto a full ocean view with sun all day long and partial sunset. If the weather is clear, you can see Saba Island and Statia, past the les Petit Saints. This nice large villa is made of two buildings. The main building opens onto the front terrace that faces the ocean and surrounds the intermediate lap pool. The living room is minimalist in design. All the furniture and decor are crisp. This large room accommodates a well-equipped gourmet kitchen, which is separated from the living room by a large bar with stools ideal for a drink. The living room features sofas and armchairs and opens onto the terrace with a view. On the other side, the master bedroom, offers a nice ocean view. The second building accommodates the other bedrooms. Those upstairs have an ocean view, while the ones down below open onto the tropical patio. All offer the same amenities. A large dining table is perfect for lunch or dinner with friends, while lounge chairs invite you to sunbathe or relax as you admire the view. The intermediate lap pool is ideal for swimmers. Conveniently located in Gustavia, the villa is a short distance from shops, restaurants, and nightclubs. Located at the back of Bedroom 1. Opens onto the interior patio. Located at the back of the living room. Overlooking the front garden and the interior patio. View of the sea. Beds can be pushed together to form a king. Connects to Bedroom 6 by the bathroom. Overlooks the front garden and the interior patio. Connects to Bedroom 5 by the bathroom.